If you read my last post, and the one before, you'll know that I developed a wholewheat no-knead dough that can be kept refrigerated for weeks and with which you can make all sorts of flatbreads, pizza dough, and some fabulous hamburger buns that are not heavy -- in fact, as I wrote before, I don't like heavy buns and these were just light and tasty enough (with a slightly crispy bottom) to compliment the burger rather than dominate it." While I was finishing the trials on that recipe, I decided to make a new homemade vegan burger-- one made from inexpensive, simple, healthful ingredients, and suitable for soy-free and gluten-free diets, too. That meant, no gluten powder, TVP/TSP, xanthan or guar gum, etc. (though I have nothing against any of those ingredients!). Well, who knew that it would take me 5 tries! But it did-- I've been obsessed with these burgers for over a week! (Good thing my husband likes burgers any ol' time.) I got the basic ingredients pretty much nailed right at the beginning, but there was some fooling around with amounts and trying, then discarding, extra grains as an addition. I wanted the burgers to not be too "squishy", as I find many bean burgers, and I wanted more flavor than most I've tasted. I concentrated on umami-carrying ingredients for the seasoning (umami is also called the "fifth flavor" and foods that contain umami compounds are powerful flavor enhancers-- read about it here and here) and finally found the combination that carried enough flavor for my taste. Adding small amounts of mushrooms, onions, soy sauce (or my Soy-Free Sauce), miso, nutritional yeast, tomato ketchup, wine and dark sesame oil contributes umami and synergizing umami for full flavor. Play around with the herbs and spices, if you like! “At last, oats that people with celiac disease or gluten intolerance can enjoy, too! Available in three varieties--Rolled, Quick-Rolled and Steel Cut--and made from oats grown by our cooperative of over 200 farmers dedicated to growing only pure, high-grade oats. Each farm delivery is sampled hundreds of times and tested with an R5 ELISA gluten test to ensure the absence of gluten. Advanced color-sorting removes undetected impurities." You can also order them online at http://www.glutenfreeoats.com/ and amazon.com carries several brands. Check your local health food store, too. IMPORTANT NOTE ON THE ABOVE: A small segment of celiacs react to even pure, GF-certified oats. See my comments in the comment section of this post for more on that. These are best made a day ahead of serving time, and can be frozen in a freezer container with pieces of cooking parchment between them. Note: If you don’t have pinto beans, you can use Romano beans or small red beans (not kidney beans). Mix the softened onions and mushrooms in a large bowl with the mashed beans, oats, and squeezed grated potatoes. In a small bowl, whisk together the wine, soy sauce, ketchup, nutritional yeast, miso, paprika, salt, garlic granules, herbs and spices, and pepper. Add to the mixture in the large bowl and stir together thoroughly. Divide the “batter” into 8 approximately 1/2-cup portions on 2 small parchment-lined baking sheets and pat down to patty shapes, not touching. Cover loosely with foil, not touching the tops of the patties, but sealed around the edges of the pans. Bake for 20 minutes. Cool thoroughly, then refrigerate until cold all the way through and firm. Before serving, brown in a non-stick skillet (or cast iron or hard anodized), lightly oiled (dark sesame oil is good). Cover and cook over medium-high heat for a few minutes, until the bottom is browned, flip over and brown the other side. Serve as is with ketchup, gravy or other sauces, or on a bun with all the trimmings. 175.3 calories; 12% calories from fat; 2.6g total fat; 0.0mg cholesterol; 461.7mg sodium; 516.5mg potassium; 29.8g carbohydrates; 7.1g fiber; 3.1g sugar; 22.6g net carbs; 9.1g protein; 2.9 points. IMPORTANT: To replace some of the complex qualities that a good fermented soy sauce or tamari supplies, try adding wine, broth, and/or mushroom broth or concentrate to yourdish, in addition to using the soy sauce substitute that follows. Dissolve the Marmite and salt in the first 1 cup of hot liquid. Mix in the remaining ingredients and store the mixture in a covered jar in the refrigerator. It will keep for several weeks. A week ago I posted a recipe that I had been working on for several weeks-- an almost-all-whole wheat (3/4) easy flatbread dough that could be made in the no-knead style and can be refrigerated and used whenever you need it. It's a wonderful dough, but I really wanted a 100% whole wheat dough that didn't scream "whole wheat", if you know what I mean. One with great flavor, versatility, and which could be used for crispy or soft flatbreads, puffy, flexible pita, really good pizza crust, and even soft rolls and burger buns-- a tall order. So, I've been at it again and I'm really, really pleased with the results. The pizza was great (and I am picky about pizza crust! 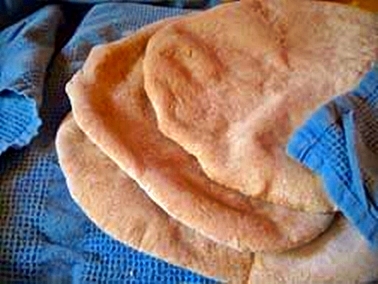 ), the pita puffed nicely, and the flatbreads were wonderful for wraps and even cracker bread. We were particularly happy with the burger buns. I don't like heavy buns and these were just light and tasty enough (with a slightly crispy bottom) to compliment the burger rather than dominate it. This is pretty much the same dough as the one I posted last week, except that I used all wholewheat flour, added some potato flakes (which always lighten up whole grain breads, it seems), and used the no-knead method exclusively. This no-knead dough seemed to be easier to handle than the previous version. I hope you'll try this dough (see all the photo ideas in the last post, too) and invent your own flatbreads, wraps and buns. Mix together the flour and the salt in a medium bowl or dough-rising bucket—preferably with a lid—with a whisk. In a smaller bowl, or a measuring pitcher, mix the water, potato flakes, sugar and yeast. Let stand for a couple of minutes. Add the oil to the yeast mixture and pour into the flour mix. With a wooden spoon or dough whisk, stir into a rough dough. If it’s a bit too hard to stir, just knead it very briefly in the bowl til it all comes together. Cover with the lid or place the bowl inside of a large food-safe plastic bag (use a twist-tie, but make sure the bag “poofs” up over the bowl a few inches) and let it rise on your kitchen counter until doubled in size. Now, you can “knock it back”, as Brits say (poke it until it collapses), cover again as above and refrigerate for up to two weeks, or you can use it right away. (Tip: Refrigerated dough is easier to handle.) You can use some of it right away, and keep the remaining dough in the fridge for other uses—that’s the beauty of this recipe! If you are using refrigerated dough, there is you don’t need to bring the dough to room temperature before shaping—another plus! But your oven or pan must be hot, or at least heating up while you shape the flatbreads. Flatbreads can rise for a few minutes, but pizza should immediately be topped and placed in a very hot oven (500-550ºF). TIP: I generally shape flatbreads on a piece of baking parchment spread over the surface I’m using, or on a silicone mat. You can get away with less flour that way. Parchment is handy because, if your dough sticks to it just cut away the excess around your flatbread and bake it with the parchment attached! It will come away just fine after baking. I generally top pizza dough which is on parchment and then transfer the pizza (using a pizza peel) to the hot pan or stone in the oven, parchment and all! BASIC FLATBREADS: NOTE: Even though this is a yeast dough, you can use thin flatbreads like a tortilla or sandwich wrap, or a stuffed bread. Pinch or cut off 12 golf-ball-sized pieces of the dough for pita or flatbreads. Roll them to less than 1/4” thick—they can be round, oval, or odd-shaped; it doesn’t matter! Now, you “bake” them in a hot skillet on the stovetop on at a time. They cook very quickly, so it doesn’t take long. (I often quickly make 2, 3 or 4 for lunch or breakfast with my refrigerated dough and it takes only minutes once you’ve done it a few times.) Flip them over for a minute or two if you want both sides to be more crispy. Flip one flatbread at a time onto the hot skillet and cook a minute or two, until it’s bubbling up and has brown spots on the bottom. Flip it over and cook until there are brown patches on the second side. NOTE: You may have to turn the heat down on your stove, or adjust the heat as you go-- stoves vary. You don't want the breads to burn right away. After you've done a few, you'll know how to handle your stove next time! Alternative method (I prefer this method for thin cracker breads. ): You can bake several at one time like pita in the oven, but prick the dough all over with a fork before baking so the dough doesn’t puff up so much. Watch carefully so they don’t burn. If you are eating them right away, you can brush or spray each bread with a little olive oil (infused with garlic is yummy!) and sprinkle with any toppings you want (see text above). If they are not to be used right away and you want to keep them softened (for a wrap, perhaps), cool them in an open paper bag. If you want them crisp, cool on baking racks. See this post for shaping and baking: http://veganfeastkitchen.blogspot.ca/2006/08/5-foods-you-have-to-eat-before-you-die.html Important—don’t stretch pita dough, just roll it. If you don’t have a pizza stone, you can use a cast iron skillet or griddle. If you have neither, heat baking sheets in the oven and use those. Cool the pita in an open paper bag so that they stay flexible. I generally roll or pat the dough into an 8" circle (on a lightly-floured piece of baking parchment or silicone baking mat) and then use the weight of the dough to stretch it into a thinner, larger round by draping it over an over-turned mixing bowl. See this post for instructions and a photo, as well as baking instructions: http://veganfeastkitchen.blogspot.ca/2006/0/vegan-pizza-night.html Then I place the dough on baking parchment which is sitting right on the pizza peel for topping. To stretch the dough , you drape the dough over an over-turned bowl and gently stretch it until it is the right size, using the weight of the dough stretch it. Work slowly so that you don’t tear the dough. If it does tear, by some chance, you can patch it and seal it again. The pizza does not have to be absolutely round! You can use a rolling pin instead, but Neapolitans are of the opinion that stretching the dough rather than rolling it makes a flatter and less chewy crust. Divide the dough into 11 equal pieces (about 3 oz. each). Fold down the sides of each pieces and pinch together on the bottom to make a ball. On floured parchment, use the palm of your hand (oil your hands first) to press each ball down flat. Now pick up the disc of dough and turn it, holding the edges, so that it stretches a bit. Lay it down again and press again. What you are aiming for is a flat circle of dough about 4-inches across that is slightly concave in the middle. Rise the buns made from refrigerated dough for about an hour on baking sheets lined with parchment and sprinkled with cornmeal or sesame seeds. When doubled, brush gently with soy or nut milk. Bake at 350 to 400°F (depending on how soft or crisp you want the outside of the buns) for 15-25 minutes. Cool on racks. Nutrition (for 1 of 12 pita or flatbread): 152.5 calories; 17% calories from fat; 3.0g total fat; 0.0mg cholesterol; 285.3mg sodium; 164.0mg potassium; 28.4g carbohydrates; 4.7g fiber; 0.9g sugar; 23.8g net carbs; 5.3g protein; 2.5 points. Nutrition (for 2 slices of one large pizza [cut into 6 ], crust only): 212.2 calories; 16% calories from fat; 4.0g total fat; 0.0mg cholesterol; 379.8mg sodium; 224.9mg potassium; 39.8g carbohydrates; 6.6g fiber; 1.2g sugar; 33.2g net carbs; 7.5g protein; 3.8 points. Nutrition (for 1 largish flatbread out of 8): 228.7 calories; 17% calories from fat; 4.4g total fat; 0.0mg cholesterol; 428.0mg sodium; 246.0mg potassium; 42.7g carbohydrates; 7.0g fiber; 1.3g sugar; 35.6g net carbs; 8.0g protein; 4.1 points. Nutrition (for 1 of 11 hamburger buns): 166.3 calories; 17% calories from fat; 3.2g total fat; 0.0mg cholesterol; 311.2mg sodium; 178.9mg potassium; 31.0g carbohydrates; 5.1g fiber; 0.9g sugar; 25.9g net carbs; 5.8g protein; 2.8 points. Nutrition (for 1 cracker bread or thin flatbread out of 22): 83.2 calories; 17% calories from fat; 1.6g total fat; 0.0mg cholesterol; 155.6mg sodium; 89.5mg potassium; 15.5g carbohydrates; 2.6g fiber; 0.5g sugar; 13.0g net carbs; 2.9g protein; 1.3 points. I've been using this dough quite a bit. It's so easy to make and convenient and quick to make. You can keep it in the refrigerated for a couple of weeks and just use what you need a bit at a time, if you like. I've made flatbread wraps for my husband's on-the-road lunches several times and breakfast wraps, too; flatbreads topped with various things for accompanying soups and salads; pizza for a birthday dinner for six; and stuffed breads, too. Here are some photos and notes, and then the recipe. Have a ball experimenting with this-- everyone I've served my experiments to has been very impressed! The following pics are a version of stuffed Piadine (stuffed flatbreads from Romagna called crescione). The dough for these breads is usually unleavened or made with baking powder, but this recipe worked just as well. You cook these just like the flatbread, but at a slightly lower heat. Sweet Crescioni-- with peach jam and chocolate! **I include a no-knead version in this recipe, but I have been using the kneaded version lately because it’s easier to handle (it only needs 5 minutes kneading). The no-knead version requires more flouring during shaping, and an experienced hand at rolling out well-hydrated dough. NOTE: If you prefer to make this with only unbleached white flour (4 cups), you can omit the sugar and use only 1 tablespoon of oil. See text above for more info. FOR NO-KNEAD VERSION: All the same; the only change is to use only 2 3/4 cups whole wheat flour. In a smaller bowl, or a measuring pitcher, mix the water, sugar and yeast. Let stand for a couple of minutes. Add the oil to the yeast mixture and pour into the flour mix. With a wooden spoon or dough whisk, stir into a rough dough. If using the No-Knead method, that’s all you have to do. If you are kneading, either by hand or by machine, knead about 5 minutes. If using a machine, remove the dough from the machine bowl and place into a lightly-oiled medium-sized bowl or dough-rising bucket. Cover with the lid or place the bowl inside of a large food-safe plastic bag (use a twist-tie, but make sure the bag “poofs” up over the bowl a few inches) and let it rise on your kitchen counter until doubled in size. Now, you can “knock it back”, as Brits say (poke it until it collapses), cover again as above and refrigerate for up to two weeks, or you can use it right away. (Tip: Refrigerated dough is easier to handle if you use the No-Knead version.) You can use some of it right away, and keep the remaining dough in the fridge for other uses—that’s the beauty of this recipe! BASIC FLATBREADS: NOTE: Even though this is a yeast dough, you can use thin flatbreads like a tortilla or sandwich wrap, or a stuffed bread (see Piadine photos above). If you are eating them right away, you can brush or spray each bread with a little olive oil (infused with garlic is yummy!) and sprinkle with any toppings you want (see text above). If they are not to be used right away and you want to keep them softened (for a wrap, perhaps), cool them in an open paper bag. To keep them more crisp, cool on baking racks. Nutrition (for 1 flatbread of 12): 163.2 calories; 15% calories from fat; 2.9g total fat; 0.0mg cholesterol; 284.6mg sodium; 139.4mg potassium; 30.5g carbohydrates; 4.0g fiber; 0.9g sugar; 26.5g net carbs; 5.3g protein; 2.7 points. Nutrition (for 1 largish flatbread out of 8): 244.8 calories; 15% calories from fat; 4.4g total fat; 0.0mg cholesterol; 426.9mg sodium; 209.0mg potassium; 45.8g carbohydrates; 6.0g fiber; 1.3g sugar; 39.8g net carbs; 8.0g protein; 4.5 points. PITA: See this post for shaping and baking: http://veganfeastkitchen.blogspot.ca/2006/08/5-foods-you-have-to-eat-before-you-die.html If you don’t have a pizza stone, you can use a cast iron skillet or griddle. If you have neither, heat baking sheets in the oven and use those. Cool the pita in an open paper bag so that they stay flexible. Nutrition (for 1 pita of 12): 163.2 calories; 15% calories from fat; 2.9g total fat; 0.0mg cholesterol; 284.6mg sodium; 139.4mg potassium; 30.5g carbohydrates; 4.0g fiber; 0.9g sugar; 26.5g net carbs; 5.3g protein; 2.7 points. PIZZA: I generally roll or pat the dough into an 8" circle (on a lightly-floured piece of baking parchment or silicone baking mat) and then use the weight of the dough to stretch it into a thinner round by draping it over an over-turned mixing bowl. Then I place the dough on baking parchment which is sitting right on the pizza peel (see paragraph directly above). See this post for instructions and a photo, as well as baking instructions: http://veganfeastkitchen.blogspot.ca/2006/05/vegan-pizza-night.html You drape the dough over an over-turned bowl and gently stretch it until it is the right size, using the weight of the dough stretch it. Work slowly so that you don’t tear the dough. If it does tear, by some chance, you can patch it and seal it again. The pizza does not have to be absolutely round! You can use a rolling pin instead, but Neapolitans are of the opinion that stretching the dough rather than rolling it makes a flatter and less chewy crust. Nutrition (for 2 slices of one large pizza [cut into 6 ], crust only): 217.6 calories; 15% calories from fat; 3.9g total fat; 0.0mg cholesterol; 379.5mg sodium; 185.8mg potassium; 40.7g carbohydrates; 5.3g fiber; 1.1g sugar; 35.4g net carbs; 7.1g protein; 3.9 points. NOTE: If you make your own soymilk and/or tofu, or have access to fresh okara (the leftover soy pulp), you might like to try my recipe for Okara/Cashew Ricotta at this post. This mixture is very similar to the creamy full-fat ricotta used in Italy, which bears little resemblance to the watery, grainy ricotta available to most North Americans. It's so creamy that you can use it as a spread on bread, or a filling for crespelle (crepes), or even in desserts. In a food processor, mix about 3 cups of the crumbled tofu, the ground cashews, the lemon juice and salt until they are VERY smooth. Then crumble in the remaining tofu and process again. The resulting mixture should be mostly smooth, but with a little graininess-- it doesn't have to be like cream cheese. Scoop the "ricotta" into a plastic container and refrigerate. It firms up when chilled. Nutrition (per 1/2 cup): 126.6 calories; 51% calories from fat; 7.6g total fat; 0.0mg cholesterol; 199.1mg sodium; 229.1mg potassium; 6.4g carbohydrates; 0.5g fiber; 1.7g sugar; 6.0g net carbs; 9.3g protein; 3.1 points. For a quick tofu ricotta to use in lasagne or other pasta dishes, you may prefer to use this simple mixture: Mash 1 lb. very fresh drained medium-firm tofu, reduced-fat if possible, with 6 T. soy, nut or rice milk and 1/2 tsp. salt. This makes 2 generous cups. This is a tasty vegan "ricotta"-- the almond milk has a clean, mild taste. Place the hot water and almonds in a blender and blend until a very smooth "cream" results-- be patient! It cannot be grainy. Add the rest of the ingredients and blend again well. Pour the mixture into a medium, heavy-bottomed saucepan and stir constantly over medium-high heat until it thickens and comes to a boil. Turn the heat down to medium and cook 1 minute more, stirring. MICROWAVE OPTION: Pour the mixture into a large microwave-safe bowl or beaker. Cook in microwave oven for 2 minutes at 100% power. Whisk. Microwave 1 to 2 minutes more, or until thickened. Scrape the mixture into a container and let it come to room temperature. Beat it with a whisk or electric hand mixer. Cover and chill. When it is chilled and firm, mash and stir it with a fork, until it has some texture. Refrigerate. Nutrition (per 1/2 cup): 137.9 calories; 62% calories from fat; 10.1g total fat; 0.0mg cholesterol; 194.7mg sodium; 107.6mg potassium; 10.0g carbohydrates; 1.6g fiber; 1.6g sugar; 8.4g net carbs; 3.2g protein; 3.3 points. Enjoy and have fun inventing your own variations!